PLEASE BRING YOUR PET INTO THE CLINIC IN A COLLAR, OR HALTER, AND ON A LEASH, OR IN A PET CARRIER. THANK YOU. Effective as of August 01, 2018 the cost of a dental cleaning will be $225.00 per pet, which includes an examination. If your pet is unable to undergo a dental cleaning you will only be responsible for a $25.00 examination fee.There is a $25.00 hold upon scheduling an appointment, of either a VISA or MasterCard. This is not taken from your card; it is only a hold, and you will be responsible for the $225.00 upon completion of your pet's dental cleaning on the day of your appointment. Our company, Waggin Smiles, knows that today it is becoming increasingly hard to make do with every dollar of your hard-earned money. Although we continually make every effort to give you top-notch pet dental cleaning services at low prices; we regret to inform you that substantial increases in our operating costs has left us with no alternative but to increase our dental cleaning prices. OUR CANCELATIONS AND APPOINTMENTS POLICY: Please call and let us know if you need to cancel within 72 hours of the day of your pet's appointment. We have wait lists at most of our clinics and we would like to offer that appointment time to another pet owner. As always, we are committed to providing you with excellent pet care services throughout the year. We are looking forward to your continued patronage despite this increase, and we hope that you see that our services are worth every dollar you spend on them. 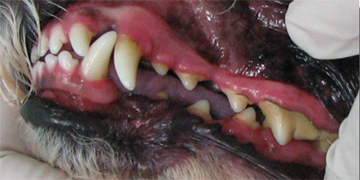 We will meet with you and your pet upon arrival for your pet's non-anesthetic dental cleaning. At this time we will ask you to fill out a medical record form for your pet and you will be asked about your pet's health history. A thorough understanding of your pet's health gives us the information we will need to insure that your pet is comfortable and safe while undergoing the procedure. You will also receive a copy of the medical record at the end of the dental cleaning. 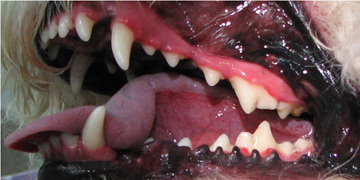 It will provide you with detailed information on the health of your pet's teeth and gums. 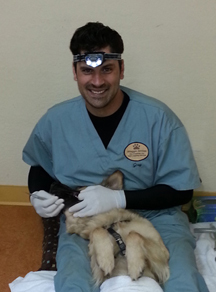 Our attending veterinarian performs an examination on every pet prior to the dental cleaning. This assures you that your pet is a candidate for the non-anesthetic teeth cleaning procedure. In the event our veterinarian finds your pet is NOT a candidate for the dental cleaning at this time, you will be advised prior to the procedure. Our veterinarian may refer your pet out after the procedure has begun if they note an issue with oral health, general health, or deem your pet to be a non-candidate due to the pet's demeanor. 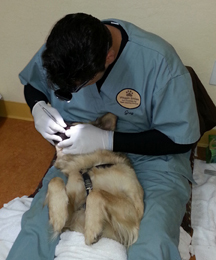 The dental cleaning your pet will be undergoing is very similar to your own dental cleanings. Plaque and tartar are gently removed from the inside and outside surfaces, the spaces between the teeth, and from under the gum line. After the cleaning we polish with a pumice-based paste and rinse with pet-specific chlorhexidine mouth wash.
Our hygienist will place your pet comfortably in their lap or between their legs to start the cleaning process. Our hygienists are specifically trained in the handling of pets and are able to keep them calm through the entire cleaning procedure. Your pet will be constantly praised, reassured, and handled with utmost care. Due to our expertise in the handling and care of dogs and cats, only a small percentage of pets cannot be treated by our non-anesthetic teeth cleaning methods. We find that most pets cooperate perfectly while undergoing our procedure. We commonly recommend dental cleanings at 6 to 12 months intervals. Our recommendations for dental cleanings are based on the level of gingivitis, tartar, and plaque build-up. Due to our expertise in the handling and care of dogs, only a small percentage of dogs or cats cannot be cleaned. If we determine that your pet is not a candidate during the examination, we may refer you back to your regular veterinarian for further evaluation. Although you may have been referred by your own veterinary hospital for the non-anesthesia dental cleaning; not all pets will be candidates for this procedure. Waggin Smiles' veterinarians will make the decision as to whether it is necessary for more dental care under general anesthesia. We have seen an increase in pet owner's awareness of dental disease and how important it is to them to maintain a preventative care plan to help protect their pet's teeth and gums. Our website contains valuable information for you as a pet owner.